Looking for a shortbread recipe that's gorgeous and deliciously simple? Look no further! 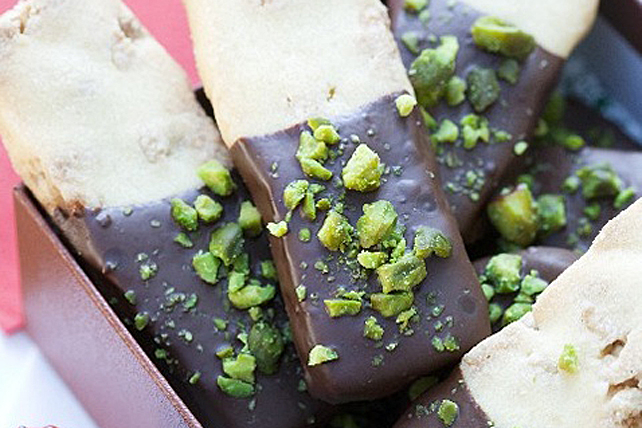 These easy chocolate-dipped pistachio shortbread cookies taste as good as they look! Combine flour, baking powder and salt. Beat butter, sugar and vanilla in large bowl with mixer until light and fluffy. Gradually add flour mixture, beating well after each addition. Add 1/3 cup nuts; mix well. Bake 18 to 20 min. or until cookies are lightly browned. Cool on baking sheet 5 min. Remove to wire racks; cool completely. Break apart into 48 cookies. Cover additional baking sheet with parchment. Melt chocolate as directed on package. Dip cookies, 1 at a time, halfway into chocolate; place on prepared baking sheet. Sprinkle with remaining nuts. Let stand until chocolate is firm. Substitute coarsely chopped pecans for the pistachios.